The Fuschia Files attended QUEENS TALK this week + it was magical! QUEENS TALK is a monthly series curated by Boston-bred author Samantha Casseus as a safe space for women of color to connect, share and vibe! QUEENS TALK: Creating stronger bonds among phenomenal women in Boston and beyond. How often do we come together just to talk and celebrate each other? 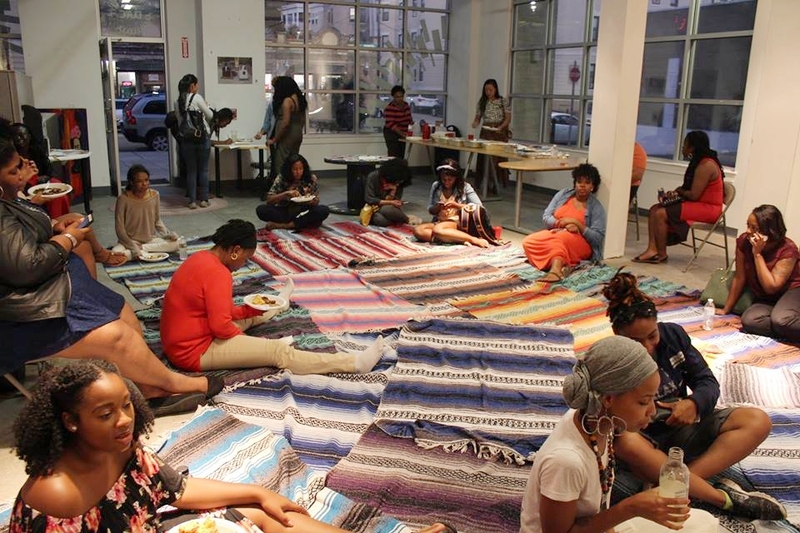 QUEENS TALK allows a space for women of color to dig past the surface and get personal, share stories and connect. Living in a society that is constantly telling us we are not enough- having a safe space for women to connect is crucial to our self-growth. QUEENS TALK encourages attendees to be prepared to form bonds and relationships with at least one new sister-friend each meet. The reoccuring theme and goal is restoring old relationships and creating new ones. This month's feature presenter and Queen of manifesting herself is Des Polk aka Goddes aka Radical Black Girl (RBG)! She is a Boston-born performance artist and art activist who is currently studying Dance and African American Studies. She has been dancing professionally since the age of 5 and sharing her poetry with audiences since age 12. She is concerned about speaking truth to a country that attempts to rewrite its own history while having actively tried to suppress African and Native American history and culture. She is also deeply passionate about advocating for marginalized groups of people, especially low-income communities of color, women of color and young self-identifying black girls. RBG's main goal is the radical awakening of the authentic self to become audacious, unapologetic and empowered. She hopes to inspire transformation of self and communities in hopes that we can change our realities through art. We shared discussions on what keeps us motivated, where + how we have overcome roadblocks on our way to our goals, and how to keep ourselves accountable when life combats you with feelings of self-doubt. Women in the room shared that they allow themselves a day to be overwhelmed; but only a day- to dwell, to mope around, and to be sad- after that, they pick themselves UP, analyze a new plan + execute with confidence! Further in the discussion, we shared that productivity is not just work. Being productive in our interpersonal relationships by adding love and caring can lead to fulfilling results. Productivity can also be about vulnerability; taking time to just BE and allowing space to understand our present situation. "I'm only limited by my mentality." "positive affirmations + meditation keep me going." "I've seen what my parents went through. I'm motivated to go harder just for them." Listening with intention, care + understanding. The vibe QUEENS TALK provided was a space for us, by us. Affirming our intentions through writing. Letter to Self: Be your own cheerleader! Write a letter to yourself + express your strengths, and all you have accomplished. This may serve as a tool for self-reflection, and may also help you when you endure a bad day and need a daily reminder of your MAGIC. ACCOUNTABILITY SISTER: A friend who will check in with you, see how you are progressing towards your goals + help remind you of your queendom. As a closing exercise, the creator of QUEENS TALK Samantha Casseus introduced "Accountability Sisters" as a method to keep us connected with one another + create intentional efforts to lead each other on a path towards more love and self-acceptance. We each shared in the room our takeaway from the session, and the energy was filled with positive vibrations. Through this session, we each carried away a piece of understanding that even through all the ups + downs, we are QUEENS. Our beautiful hosts created a great vibe! Beya J. is a city planner, interested in travel, writing + urban settings. Through her travels, Beya has been able to explore and participate in extensive cultural immersions to learn more about world religions, politics and music.